Fermentation is the oldest, simplest, healthiest, and perhaps the tastiest means of preserving food. Throughout history, all cultures had a fermented preparation and many of them being popular worldwide such as kimichi, soy sauce, sauerkraut, beer, yogurt, and sourdough. There are some tasty wild edible greens out there and it would be great to capture and enhance the health benefits of these edible plants so that they can be enjoyed anytime. Many people are spending an inordinate amount of money on expensive probiotic drinks because research shows probiotics are important. I don’t deny that probiotics are critical to good gut health, in fact they are essential; however the natural health care industry has grown exponentially and make no mistake, they too are out to make huge profits. The Internet has become a battleground for your health supplement dollars and countless natural health marketers are duking it out for your patronage. It only makes sense to get what your body needs from the free food that grows all around us. One only has to look at the food-like products on store shelves to know that some of the ingredients used to prolong shelf life are not fit for human health. For a list of some items and how they are known to affect health click here and download the two PDF files that can help you learn more about ingredients. Whenever possible it is really important to either increase foods you purchase that are fermented or ferment vegetables and wild edible plants. Part of having a great immune system is having a digestive system that is not compromised and consuming fermented foods is one thing you can do to help better your health. Our bodies naturally ferment some of the foods we eat because fermentation is a natural process that takes place in our digestive system; it is the enzymatic decomposition of foodstuffs, particularly carbohydrates, by microbes. This process takes place throughout our gastrointestinal tract with the intensity of fermentation depending on microbe numbers, which are generally highest in the large bowel. save you money! Adding small amounts of fermented foods to each meal will give your body 100 times more probiotics than any supplement. Fermenting foods is not the latest health craze – it has been entrenched in human history for thousands of years. Before Christ, the Greeks knew about the health benefits of fermented cabbage. They, and the Romans used sauerkraut to treat and prevent intestinal infections. British explorer, Captain Cook (1728 –1779) used sauerkraut and lime juice to prevent scurvy on his three-year journey around the world. Throughout Europe, and Russia, sauerkraut and other lactic acid fermented foods such as kefir, yogurt, buttermilk, kapusta, kvass, borscht, etc.) are entrenched in the diet after centuries of use. For hundreds of years and to this day, many African cultures use lactic acid-fermentation as a way of preserving gruels made from corn and sorghum. Even the fermenting liquid can be added to salad dressings, sauces and if you’re up to it, just drink it as is! Imagine the powerhouse of life-nourishing nutrients that your body will benefit from when you ferment the most nutrient-dense edible plants. Even better, these plants are free! So how do we ferment wild edible plants? 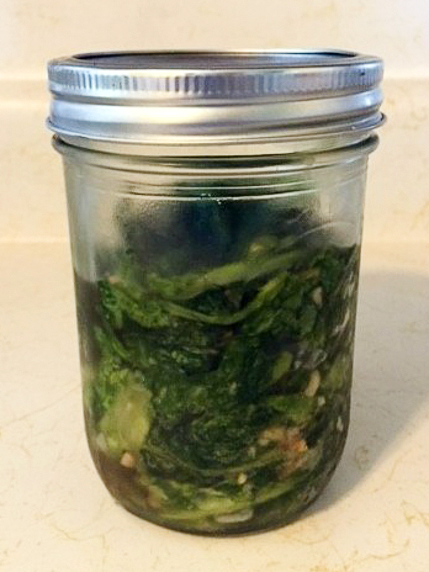 After you have harvested lots of edible wild greens then click here for a simple step-by-step process on how to ferment your harvest! Fermentation is the oldest, simplest, and healthiest way to preserve food and it is a very important food to incorporate into our daily diet. Hi, I love your post! I’ve been eating “weeds” around my garden for a long time, yet I hadn’t really thought about fermenting them; I think some things like dandelion would taste incredible fermented. I have heard of people fermenting nasturtium seed pods, and apparently they taste a lot like capers!